Frank Richards (Francis Philip Woodruff) was born in 1883. After the death of his parents he was brought up by his aunt and uncle in Monmouthshire. He worked briefly as a coalminer but in April 1901 he joined the Royal Welsh Fusiliers and served in India and Burma. Richards left the army in 1912 and found work as a timber assistant. On the outbreak of the First World War he was re-attached to the 2nd Battalion Royal Welsh Fusiliers. Richards was sent to the Western Front and he took part in the offensive at Mons. On the morning of 23rd August, General Alexander von Kluck and his 150,000 soldiers attacked the British positions. Although the German First Army suffered heavy losses from British rifle fire, General John French was forced to instruct his outnumbered forces to retreat. French favoured a withdrawal to the coast but the British war minister, Lord Kitchener, ordered the British Expeditionary Force to retreat to the River Marne. As the historian, James Hayward, has pointed out: "The BEF commenced its epic fighting retreat from Mons, slipping quietly away under cover of night. These men faced a gruelling ordeal of long, forced marches south on unmade or rough cobbled roads, with little food or rest, interspersed with fierce rearguard actions to hold off the relentless advance of the Germans." On 26th August, General Horace Smith-Dorrien, ordered the British Expeditionary Force to turn and engage the German Army at Le Cateau. The BEF managed to inflict heavy casualties on the advancing troops and were able to delay the implementation of the Schlieffen Plan. However, BEF also had significant losses with 7,812 of all ranks, killed, wounded and missing out of the 40,000 men who took part in the battle. That evening, General John French ordered the retreat to continue. Richards was with soldiers during the retreat who said they saw vision, the Angel of Mons. He later argued: "If any angels were seen on the retirement they were seen that night. March, march, for hour after hour, without a halt; we were now breaking into the fifth day of continuous marching with practically no sleep in between... But there was nothing there. Very nearly everyone was seeing things, we were all so dead beat." While in France he served under Robert Graves and Siegfried Sassoon. He saw action in virtually all of the major British campaigns on the Western Front without suffering any serious injuries. Richards, who at no point rose above the rank of private during the war, was awarded the DCM and Military Medal. Unable to return to the coalmines following the war because of a physical injury, Richards did a series of unskilled temporary jobs. 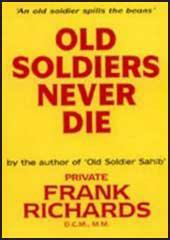 Richards published Old Soldiers Never Die in 1933. Robert Graves described it as "without exception the most valuable account of World War One written from ranks". He particularly admired "its humorous restraint in describing unparalleled horrors." 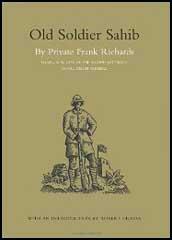 Richards followed this with another successful memoir, Old Soldier Sahib (1936), that dealt with his time in India. Richards was interviewed by the BBC for their classic multi-part documentary of the conflict, The Great War, in 1954. Frank Richards, died in 1961. If any angels were seen on the retirement they were seen that night. March, march, for hour after hour, without a halt; we were now breaking into the fifth day of continuous marching with practically no sleep in between. Stevens said: "There's a fine castle there, see?" pointing to one side of the road. But there was nothing there. Very nearly everyone was seeing things, we were all so dead beat.